I love the Sounds like Fun CD by Barbara Milne and have been singing these tunes to my children for over 19 years! The Alphabet Sounds Song by Barbara Milne is a nice quiet time or bed time song and is the first song that I use to introduce phonics to my children. When I sing my babies to sleep, I follow The Alphabet Sounds Song with Barbara Milne’s I Love You So Much. This song became a comfort song to each of my children. When my toddler wakes up frightened, he asks me to "sing the I Love You song" to him. I still have the original Discovery Toys tape cassette Sounds Like Fun, which includes these two songs as well as many other learning songs interspersed with nursery rhymes, sung in the same sweet, calming manner. If you have a child who likes to fall asleep listening to music, or if you like to have background music during play time, this is a wonderful CD. Discovery Toys now sells these songs under the title Sounds Like Learning, but I have to admit that I liked the original title better. I think the new title probably appeals more to the Baby Einstein crowd, but for a limited time you can buy the original CD for $15.00 or buy it in a bundle, along with 4 other Barbara Milne CD’s for $25.00 at IQ Boosters. I now use Barbara Milne's CDs to keep my toddler in bed in the evening. I allow him to listen to a CD only if he stays in bed and it works like a charm! And it feels so much better as a parent to say, "If you stay in bed, you can listen to music" than "If you get out of bed, x will happen". Oh, and your child does not care if you can sing in tune or get the lyrics right. Sometimes when I am singing without the CD, I get to a letter and cannot remember what word I am supposed to sing, so I just improvise. And I cannot carry a tune. At all! I am so bad that once my kids are older and have had some musical training, I can use singing as a form of punishment. Seriously. However, my babies love for me to sing to them for the first 3 -5 years of their life (the one who stopped liking my voice at 3 has perfect pitch, but even he liked it up until then). This post has been linked to Things I Love Thursday at The Diaper Diaries. Disclosure: I am not an affiliate and have not received any compensation or products. I am just sharing this with you because typing this post is more fun than folding laundry. My son loves numbers! 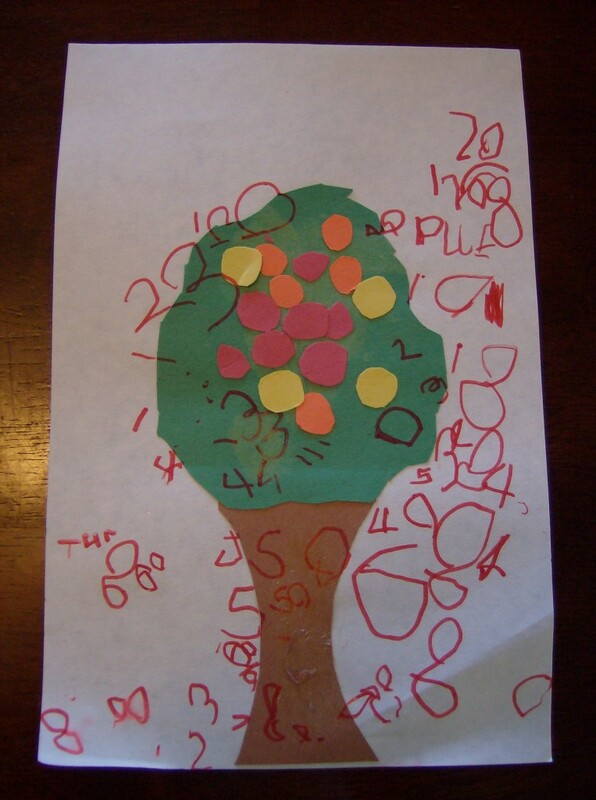 One day after reading his favorite counting book, Chicka, Chicka 123, I helped him create his own apple tree for the numbers to climb. He really enjoys doing art projects based on his favorite books, so while it is not fancy, it was lots of fun, easy, and inexpensive. We just made a rough cut out of a tree that he glued to a piece of paper with a glue stick. He did his best to cut different color circles to use for apples. 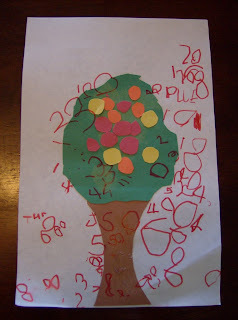 Then he drew numbers “climbing” the tree. If he did not like trying to write numbers so much, I would have given him number stickers to use. What are your favorite counting or number related books? Do you have any favorites that I have missed? 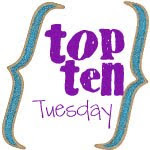 The post has been linked to Top 10 Tuesday. Disclosure: I have linked the books to amazon, where I am an affiliate, so you can read a description if you wish. However, I encourage you to check these books out at the library, since your child might not turn out to be quite as numbers obsessed as my little guy. I often overhear parents say, “I would like to read to my child more, but he/she (let’s face it, it is usually a he) just won’t sit still”. As a former reading lady and mother of several wiggly children, I thought I would link up to Works For Me Wednesday to share some of the tricks that I use to read to wiggly children. First, I start reading to my children long before they can escape (within days of birth). The earlier you start reading to your children, the more likely it is to seem like a regular daily activity like eating or bathing. My husband gasping while reading “Two beetles gasped and ran away” from Miss Spider’s Tea Party: The Counting Book . Alternate reading with an action song. When my son is wiggly, we follow Miss Spider’s Tea Party: The Counting Book with the Itsy Bitsy Spider, then read The Very Busy Spider and follow it up with several rounds of Old McDonald’s Farm. If they don’t want to sit on your lap, don’t make them. Read like the reading lady: Turn the book outward and let your child move about the room while you read. They will look up occasionally to see a picture and they will hear and retain much more than you think possible. Last week my son said, “You keep reading. I will be back; I am going to climb under the bed”. Take advantage of the times when you have a captive audience. Read during meal times. Have an older sibling read to your toddler while he is strapped in the car seat. My husband reading to the children at dinner time. Let them act out a book while you read a book like Five Little Monkeys Jumping on the Bed or Ten in the Bed. Children are more likely to want to hear a story that they were involved in choosing. Let them pick out a book at the library or thrift shop. Give them a choice between reading and something you know they don’t want to do. I sometimes ask my toddler, “would you like to read a book or clean your room? '” Let them bamboozle you into reading “one more book” before bedtime. Once they are “reading”, let them sneak a little extra reading time before they fall asleep. Nothing is more enticing than a forbidden activity! I realize the ideas in the last paragraph are somewhat controversial. Some people may view them as deceptive or encouraging deception. You did read the title of this blog, right? Covert Teaching sometimes requires subversive methods. How do you read to your wiggly children? My second oldest wiggle worm reading to my youngest wiggle worm. Disclosure: I have linked the books to amazon, where I am an affiliate, so you can read a description if you wish. However, I encourage you to check these books out at the library. Edited to change wriggle to wiggle after realizing that not everybody has teenagers who like to imitate Gollum in their household. One of the best ways I have found to encourage my children to write and draw is to help them make their own book. The directions below are for the first book I help my children make. It is fast, easy, and only requires 8 x 11 paper and scissors. If you are a perfectionist, you may want to use a ruler and a pen, if not, just eyeball your cuts. 1. Take 6 – 10 pieces of 8x11 paper and divide them into 2 equal stacks. 2. Fold each stack in half so that they are 5 1/2” x 8”. 3. Unfold, and mark a 1 inch line on both ends of the center fold (you just have to do this on the top paper of each stack): 4. On one stack cut on the lines: 5. On the other stack cut on the fold between the lines, being careful not to cut on the lines: 6. Take the stack of paper on which you cut on the lines and loosely roll them: 7. Insert the rolled paper, through the gap in the other stack of paper: 8. Gently unroll the paper and insert the uncut portion into the notches: 9. Fold the paper and you now have a blank book for your child to start filling up: Andrew is filling his book with pictures of his favorite things. How do you encourage your children to write and draw? This post has been linked to Frugal Friday at Life as Mom. This falls under the heading of “can’t she just throw some things away?” If you have ever read my blog Premeditated Leftovers, then you know the answer to that question is no. I poured a little washable paint in the containers, put the lids on, and let my son go to town: If the paint pot tips over, the lipped lid prevents the paint from running all over the place. I don’t empty the paint out of the pots; I just let them slowly dry out inside the salad container. Since the paint is water based, I just add a little water and mix it in with a paint brush when he wants to paint. How do you minimize arts and craft messes with your children?